It was a very light week in the Big 12, as evidenced by the fact that the most interesting part of Week 4 in the Big 12 was an off-field issue. First things first though, football. Kansas State kept their game against Auburn a lot closer than many people, myself included, predicted. I thought that it may end up a 2-score game, but the Wildcats held on to only lose 20-14 at home. Missed opportunities plagued the Wildcats including an interception in the endzone and three missed field goals. Although, there is a rumor that Gus Malzahn took a page right out of Bill Belichick’s playbook as Auburn was accused of stealing K-State’s signals. Kansas managed to beat Central Michigan 34-10. I didn’t find anything interesting in this game to be honest. Oklahoma topped West Virginia 45-33 in a game that was tied at the half. For a while, this game appeared as if whoever had the ball last would win. West Virginia seems to lack 2nd half play in their team, which seems unusual with Dana Holgersen when you consider his performance as the Oklahoma State offensive coordinator. Hopefully he can light a fire under the Mountaineers without breaking too many headsets. Surprise! More turmoil out in west Texas. 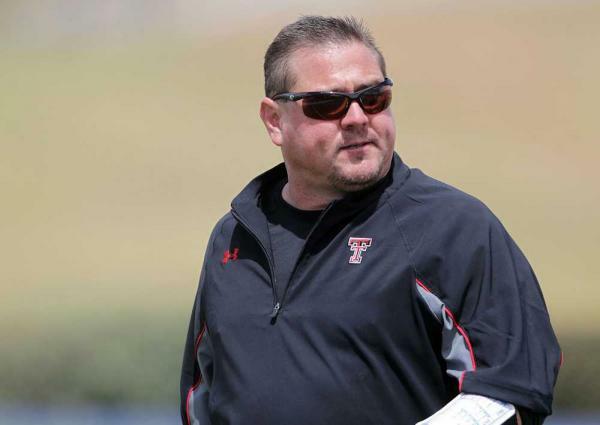 Texas Tech reportedly fired Defensive Coordinator Matt Wallerstedt on Thursday for being “under the influence of an unknown substance” on campus. All of a sudden, later that night it was announced that Wallerstedt resigned for personal reasons. What? Regardless of what actually happened, Texas Tech has their fifth defensive coordinator in five seasons and have to travel to Stillwater to play a ranked Oklahoma State team. It may not be pretty. No. 24 Oklahoma State over Texas Tech – The defensive woes that the Red Raiders have been experiencing all season in the run game and tackling in general, combined with their new defensive coordinator mid-season will prove to be costly. The Pokes should make it six in a row over the Raiders on ESPN Thursday night. No. 25 Kansas State over UTEP – K-State played exceptionally well against Auburn last week, and Bill Snyder’s team shouldn’t have too much trouble carrying that level of play over to UTEP. TCU over SMU – SMU has had way too many problems and are winless. TCU has looked good so far this season, and in this rivalry game in the Metroplex, Gary Patterson may put his subs in for the 4th quarter. Texas over Kansas – The Longhorns may have been reeling from injuries, suspensions and dismissals, but they had a bye week to work people in and now get a dress rehearsal in Lawrence. No. 7 Baylor over Iowa State – If you remember last year’s game in Waco, then you know how Paul Rhodes is feeling headed into this weekend. Baylor’s explosive offense is just too much for Iowa State, even in Ames.